A wild upbringing has always led Michelle towards a creative path. 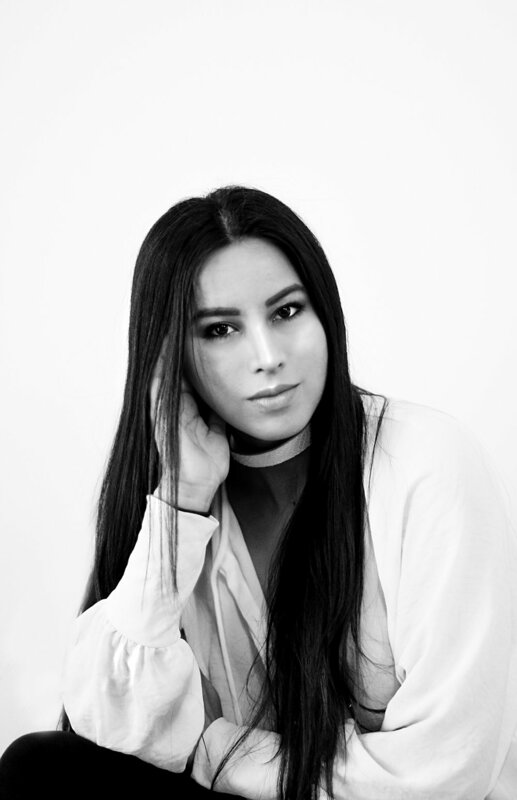 After traveling to New York from Anchorage Alaska and graduating from Parsons school of Design in Women's Ready to Wear, she worked for several design companies including Ralph Lauren and Lane Bryant. Michelle's childhood experiences shaped her interaction with the land. She and her siblings spent 6 months living on the Two Gray Hills Navajo reservation learning to live off the land. With no running water, and no electricity, this environment was ideal for forming a solid foundation of her interactions and responsibilities for the land. Always relying on her Native American heritage to inspire and influence her design process, Michelle's designs reflect a rich narrative of reaching from the past, and pulling into the present or what she calls, "Living In-Between". Living in-between these two worlds, that of her ancestors, and of one that ventures into the metropolitan savvy dweller, has been an obsession that manifests in her accessories. The beauty of craft and handwork can be seen in each unique piece. I have so many interests! Too many to keep up with, however my fascination with the natural world would have to be the one I am most passionate about. Being obsessed with the outdoors comes naturally when you are raised in Alaska, and deep sea fishing is one of my favorite past times. I believe taking time off is essential to keeping yourself in-tune with your physical and mental needs. When you are rested you are more productive and can better serve the friends and family that you love and care for most. I think the stereotype of entrepreneurs as workaholics is not always true. I would say that it most definitely doesn’t apply to me. I am a hard worker, but never over work myself. What is the scariest thing that happened to you while being an entrepreneur (that you can share)? How did you overcome it? What did you learn? The scariest part was launching my brand. Mostly because that was the point hat it became real and visible to everyone. I overcame it shortly after because after all, this is my work, and I always carry great pride in my work. I know that it comes from an authentic place, and that gives me confidence. I learned that you must strive to keep moving forward despite brief insecurities. It is a great lesson to rely on close friends and family who are cheering for you on the sidelines. I chose this business because I am from a culture of creation. I love designing and creating narratives and stories through my work. Accessories are something I could see myself doing for a very long time in a sustainable manner. I believe that consumers are starting to learn the true value of items that are hand-made versus mass-produced. I also have interest in Apparel, but right now I am focusing on one thing at a time. What is failure? Do you think it’s a crucial step to success? Failure is crucial. It is most useful if you learn from your past failures and use them to avoid future mishaps. Even better if you can learn through other’s mistakes! You can be a morning and nighttime person. That’s true for me at least. I did not have Entrepreneurial parents, but I feel that I was even more motivated by the fact that I was doing something new that no one in my family had done before, and that aided in pushing me forward and brought me great motivation. What is your proudest accomplishment in 2016? What’s the biggest goal for 2017? My proudest accomplishment was launching my brand. After a full year of preparation, I was more than ready to finally get the show on the road. I am going to keep the 2017 goals simple. Meaning not big ones, but relying on smaller more consistent goals. Keeping true to myself and my aesthetic would be one of the important ones to note. What helped you get to where you are right now? Was this accomplishment a clear goal or did it happen by chance? Was it another person or an event in your life? I have great friends and family, and without them I would likely not be where I am today. They have played a tremendous role in shaping my goals and aspirations. I think it essential to surround yourself with individuals who inspire you. Are there difficult times you go through? What helps/inspires you? Like anyone, I have experienced difficult times. I consider myself truly lucky to be surrounded by creative minds on a daily basis, and that helps uplift me past any times that might bring me down. All the beautiful thoughts and ideas that they bring into my life is refreshingly appreciated. How as being an entrepreneur affected your life? How did it change the way you think about life? Being entrepreneurial has made me feel more invested in planning a life that I love, doing what I love. It has made me believe now more than ever, that there is not just one way of doing things and pursuing a career. There are many ways and possibilities to find success and self reliance. I have been asked these questions many times prior to becoming a business owner. I believe that success is defined differently for everyone, but perseverance is the the magic sauce. I believe that the future is all about collaboration. The funny thing is that I have learned this through countless observations. Right now I consider myself lucky to be collaborating with a great artist from Sitka Alaska Mary Goddard. Her work and her heritage as a Native Tlingit woman working in the traditions of her people are highly inspiring. Being Native American myself, more specifically a member of the Navajo Nation, I have always been drawn to work with other indigenous creatives and I am convinced that collaboration is the future.